All horses listed are fully vaccinated, up-to-date on dental and hoof care, and ready for their forever homes! As horses become adopted, we are able to rescue more horses. Please consider adopting or fostering a horse, to help other horses in need! ​Mic is a 21 year old green broke Arabian gelding. He spent most of his life as a pasture puff. We affectionately like to refer to Mic as a classic older model with low miles. He has had 4 months of training, focusing on solid groundwork foundation and working up to saddle work. Mic can be stubborn and lazy. He does most things asked of him, but if he thinks he can get away with quitting work, he will try. We can’t really blame him, it would be hard to go to work after having most of your life off. No insecurities and quite confident in his manner, Mic is very settled around other horses and a natural part of the herd. He is ruggedly handsome, nice bone and size, and is registered with AHA as KAZMIC, though we do not have his papers. 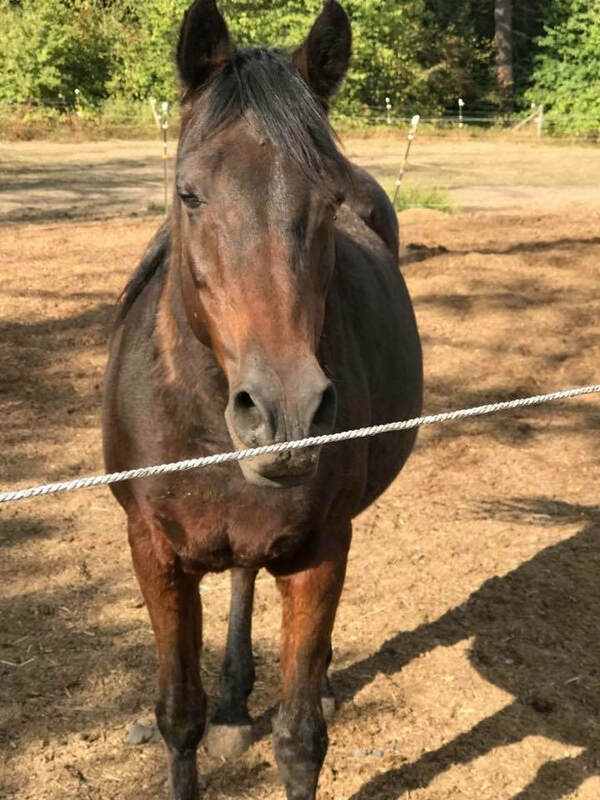 Tuesday is a 8 year old Arabian/Quarter Horse cross mare. She is short at 14 hh, but stocky and built much like a quarter horse. Tuesday is green broke to ride. She currently rides in a hackamore or rope halter. Tuesday is an anxious horse by nature. She does become quiet and confident, but it will take consistency and time. She is very willing and gives all she has. She needs more training and to connect with someone so that she feels confident and can flourish. Tuesday is the very definition of a pocket horse and she will follow you around like a puppy. She loves people, groups and looks favorably to leadership. She is very willing, has nothing but try in her, and is very forgiving. With more training, Tuesday could easily become a great kids horse. She also has Pinto markings and may be able to be enrolled in the Pinto Association. Danny is a 20 plus year old, 14 hh Arabian gelding that is handsome as they come. He is sweet, friendly, gets along well with other horses and likes kids. He is small, so perfect for someone looking for a smaller companion horse. No issues with his personality but he can’t be ridden due to a bone spur near his right hock. If worked or ridden, the soft tissue surrounding the bone spur quickly becomes inflamed and sore. Danny exhibits two key Arabian traits of brains and loyalty! He is a warm and friendly horse with a pleasant disposition. He loves people including children and could potentially be a lead line pony. ​Danny is available now for adoption as a companion horse. His easy going personality would be a great asset to any barn and his gorgeous looks just makes him better. He is currently in foster care where he is kept with other horses and is thriving. His foster mom loves him, as he is no problem at all for her. Fancy is a 17 year old retired Arabian brood mare that stands 14.2hh. It is said that at one time, Fancy was a western pleasure horse. Fancy is a beautiful mare. Fancy is bossy, but not aggressive with other mares, and can be pushy on the ground. She has been out to pasture as a companion horse in a foster home for 2 years. When Fancy first came to us, she appeared to have some weakness from behind. She wasn’t lame, just an odd gate. We decided not to ride her and she went off to a foster home as a companion horse. It is quite possible that she could be ridden, however, we are not guaranteeing she is broke to ride or will be able to carry the weight of a rider. Fancy is healthy, intelligent, opinionated, and has potential. With strong leadership and consistent handling, she could become more than a companion horse. Fancy is available for adoption as a companion horse that may potentially be a project horse, but not guaranteed. She is currently in foster care and would really like to find a permanent home of her own. Solly is a 22 year old, mostly Russian bred Arabian gelding. Solly has GQ looks, is 15.2 hh with nice bone. He has 4 months of training, and is green broke to ride. However, he did sustain a soft tissue injury near his shoulder and has not been ridden since. Solly an easy going, agreeable horse. Solly was diagnosed with Cushings Disease shortly after coming to us. There were no signs of previous founder, and he has not foundered since being with us. His conditioned is being managed very well with daily Prascend (medication) and a low sugar/carb diet. He is also kept on a dry lot. In April of 2018 he sustained an injury to his shoulder area. He has had many months to recover and is now starting to be lightly lunged. We do feel that if he is conditioned, he could carry a small rider for light riding. Though, he has not been ridden since his accident. Solly is the older brother type. He is very affectionate with people and easy going. He recently started being turned out with our blind gelding Cloud. Solly has really embraced his new role. Proudly, guiding Cloud around. It’s like he knows that he is Cloud’s eyes. He has a since of purpose and is really enjoying his work. It is because of this positive change, that we would really like for Solly and Cloud to be adopted together. Every horse needs purpose and with Cloud, Solly has found his. Solly is available for adoption now as a companion horse. With conditioning, it is possible that he may be able to safely carry a light weight rider for short rides. He and Cloud are pasture mates and would be so happy if adopted together.